After rye and spelt what other ancient grain flours are out there to try? If you’ve been following my recipes for a while you might know I am also a big fan of buckwheat, but today we are using a flour that’s totally new to me, Khorasan or Kamut as its also known (Kamut is the trademarked name of Khorasan wheat). I wanted to try making a pastry as I find it’s always a great test of how a flour works, how well it absorbs moisture, if it can be overworked and if needs extra binders to hold together. To test the flour I made multiple batches of pie dough changing the amounts of khorasan in the recipe, from 20% up to 100%. My favourite dough was made with 1/3 plain flour and 2/3 khorasan. It was easy to work with and had a great level of flavour from the khorasan. 100% khorasan works fine but didn’t taste significantly better than my end pie dough where using a little regular plain helps make a great tasting pie dough thats easy to work with. 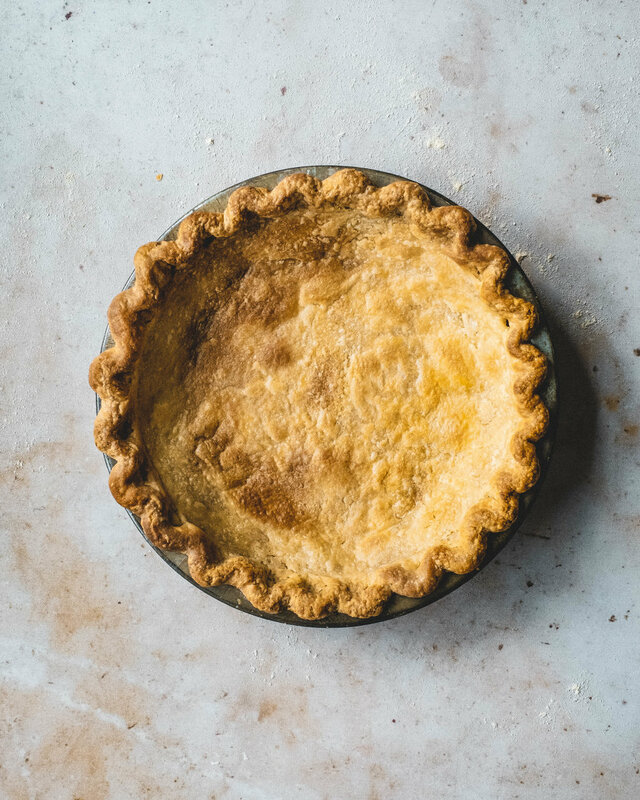 The grain is very fine and absorbs a little more moisture in pie dough than regular plain flour and it has a wonderful malty, buttery flavour that tastes almost caramelised in the pastry, it’s absolutely delicious. To make the pie dough mix together the plain flour, khorasan flour, salt and sugar in a large bowl. Add the butter and toss in the flour to coat. Rub the butter into the flour until it is in large flakes, you don’t want to rub in like you would for say a crumble, the flakes of butter makes for a nice flaky pastry. Drizzle in the water a couple tablespoons at a time, tossing together with the flour mixture. Once all the water is added you should be able to gently press the dough together, forming a uniform disc of dough. Wrap in clingfilm or a beeswax wrapper (great if you’re reducing your usage of plastic) and refrigerate for at least an hour before using. When chilled, roll out the pastry on a lightly floured worksurface until just over 10 inches in diameter then roll back onto the rolling pin and unroll into a 9 inch pie plate (I prefer metal or glass). Trim the excess dough so that the overhang is about an inch long. Fold the excess dough under itself so that it forms a thick rim around the outside of the pie plate. 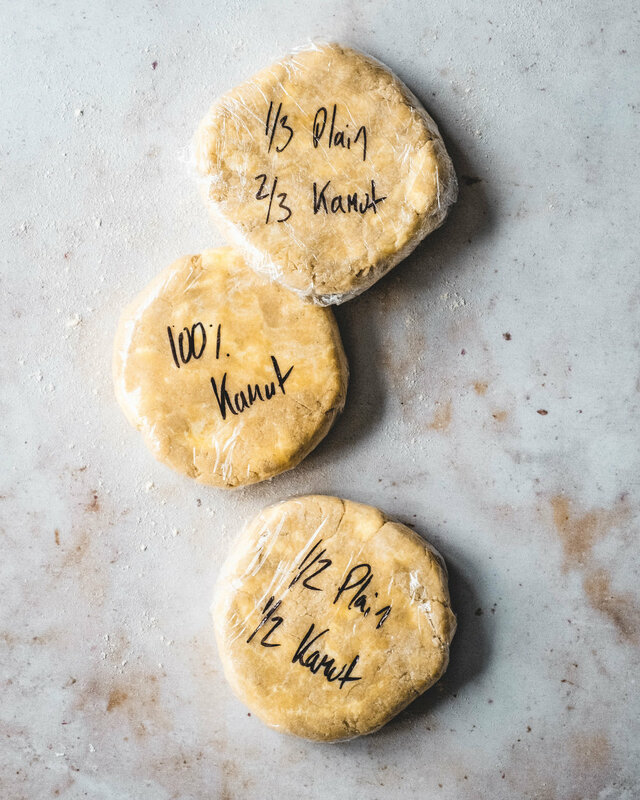 Use your preferred method to crimp the pie and then refrigerate for 30 minutes or until firm. Line the pie with a piece of crumpled parchment paper and fill with baking beans or rice. Bake in an oven preheated to 190C (170C fan) for about 20 minutes or until the crimped edge is golden. Carefully remove the parchment and the rice and place back into the oven to bake for a further 15-20 minutes or until the base is fully baked. As the filling is a wet custard brush the inside of the pie with a lightly beaten egg yolk. Bake for another minute or until the yolk is set. This will help keep the pastry crisp whilst the filling bakes. Remove and set aside whilst you prepare the filling. Reduce the temperature to 180C (160C fan). Whisk together the eggs, cream and milk then add the pancetta, gruyere, wild garlic and nutmeg along with some freshly grated black pepper. Pour the custard into the baked pie shell and grate over a little extra cheese. Bake for about 25 minutes or until the outside of the custard is set and the centre is still a little wobbly. Allow to cool to room temperature before serving. Quiche is best served on the day made but you can refrigerate it for a couple days if needed.